In my Premium Series I’m taking a look at Premium WordPress plugins and WordPress themes that I personally use, either for myself and for others. All opinions are my own and not influenced by affiliate commissions or anyone connected to the product. Pippity is a WordPress plugin that promises to make your popups less annoying to visitors. I use a popup (or hover over) to promote my newsletter and the two free ebooks you get for subscribing. The optin does pretty well with the fairly basic AWeber popup I used, so I thought it would be interesting to test. – Choose the theme you want. There are quite a lot of choices by default. – A lot of themes have color choices too so choose the combination you like, or select your own colors. – Enter the text for each section you want to use. – Set the appearance options. How long before the pop-up appears? How many days before you show it again to the same person? How many pages should they have viewed before it appears? Should it appear on Posts only page? – Finally enter your newsletter subscription form code. Pippity will automatically extract the relevant info and connect it up. If you want to see how my pop up looks go here and it will be forced to appear for you. You can create many different popups and test what change in conversion rate they generate. Below is an example of the screen straight after installing the plugin and setting up the forms – hence the figures are all zero. In a few weeks I’ll update this to show the latest figures. Overall I’m impressed as to how easy the plugin is to use, and how many features it has. The plugin is low priced for one site and you can get an attractive popup that is customized for the experience you want to give your visitors. In under 5 minutes. It will take longer to tweak and get exactly what you want, and test different variations and combinations of course. I haven’t used it long enough yet to say whether it is better than the standard AWeber one, but I wouldn’t have installed it if I didn’t think it would be. It’s very fast too, it hasn’t made a measurable difference to my page loading speed, and it currently works with AWeber, Madmimi, MailChimp, Constant Contact, 1ShoppingCart, Get Response, Campaign Monitor, Graphic Mail and iContact. Where I use this: Right here on Blog Tech Guy. Pros: Lots of templates; easy to use; no coding required; custom CSS allowed. Cons: Not free, but nothing anywhere near as powerful as this plugin is free. because it’s easier to remember, easier to type, and looks nicer. It helps a lot with very long affiliate links, ones like you get from Amazon that are very long. However the best feature is that often I don’t need to remember the affiliate link at all. For example if I type AWeber now it should change that to my affiliate link automatically. The screenshot below shows you what I have set up for Max Ninja Affiliate, but you can choose whatever keywords you like for each affiliate links. For the keywords, you can choose a maximum you have per page (I have 4 automatic ones maximum), use nofollow, open in a new window and exclude them from appearing on Pages (so sales pages etc can be excluded, though this can also be set on an individual Post/Page basis). You can also choose the wording used in the link, and, if you want, have a drop down in the formatting icons on the write/edit Post page. The settings page tracks raw clicks and unique clicks but (of course) cannot measure conversions. It does give an indication of how well your links are working, but a report by post/page would be more useful, especially if you write about an affiliate product quite often. Finally if the affiliate changes your affiliate URL, such as when they change affiliate management system, instead of having to dig through every post and page to find the links or run a database query, you can simply change the original affiliate link URL in Max Ninja Affiliate and it will mean all the other links will automatically work again. This saved me a lot of time when Thesis / DIY Themes changed system. Overall I’ve been using this plugin for a while now. It’s simple to setup, can insert links automatically, works like a URL shortener and is a great time saver and aid for sites that use affiliate links. I also use it to save me adding other frequently used links, not just affiliate links, so it is even more useful. For $37 it is an excellent investment. Where I use this: Right here on BTG. Cons: Sometimes links words in headlines within posts, but a minor gripe. Headway is a WordPress theme that has a unique Visual Editor that lets you easily change the layout and look and feel of your blog right in front of your eyes. This makes it simple to change colors and fonts, and completely removes the need for any coding. There is a learning curve in how the system works and what the options do, and it’s not perfect (yet) in a few ways (nothing is), but is a fantastic option for the non-technical blogger. I like it so much I use it on this site and a few others that I own, as well as for many clients, mainly because it’s so flexible and versatile. If I want a different layout for every page, I can have one no problem. If I want different sidebars I can have them. If I don’t want to do any coding I don’t have to, but if I do there are easy hooks and a live CSS editor and other goodies to allow me to do the complicated stuff I need to do without any extra hassle. Below is their demo video, which is obviously biased but does give you a good impression of how it aims to work. The Headway Visual Editor allows me to design my whole site, or just a page of my site easily. It works on the concept of Leafs, which are building blocks of your site. You can have a content leaf, to display the content, and a sidebar leaf to display a sidebar. You can create infinite combinations with these and different leafs, such as a Featured Posts leaf, an image rotator leaf, even a Twitter leaf, amongst others. It even has a quick start wizard that, once you upload your logo, will suggest colors to match for the rest of your site, and you can drag those colors to the elements you want to use them for. It’s unique and pretty slick. It does take some getting used to, like WordPress itself or any new piece of software. But I think once you get into it, you’ll never look back, I honestly do. There are free upgrades and it works with WordPress Multi-Site so you can install it once but use on multiple sites on the same WordPress installation. However you don;t need to get that complex, a personal license allows use on two sites you own. Overall I’ve recommended Headway a lot to people, and while some have preferred simpler themes, those with needs to do squeeze pages, sales pages, home pages with sliders, and good old blog posts, all on the one site, have loved it. Hey, if I use 10 different themes a day, every day, and I choose to use Headway, it can’t be bad, can it?! WP InstantPay is a WordPress plugin that combines an easy payment system for selling your own products and an affiliate system, right in WordPress. Like most e-commerce systems, after installing the plugin you add your product and set how much you want to charge for it. You then enter your Paypal details, upload your product to a secure location and then create your sales page. The plugin comes with templates for your thank you page(s) and download pages. Integrating with Paypal in the early versions was a little time consuming and while the help takes you through it step by step it could be daunting for the less technically minded. However, the latest version of the plugin streamlines that process and solves a lot of hassles. You can also integrate the plugin with AWeber (at the time of reading GetResponse should be available too), so buyers and affiliates can automatically be added to (the same, or separate) email lists. Just the above would be worth the $67 price (coupon code SUMMERTIME will get you 50% off until Monday 6th June 2011!). However, it’s on the affiliate side that the product has a notable difference. It removes the need for you to do any work. For those of you who had had affiliate systems know, there are two ways – a system that does commission payments for you (like Clickbank and Shareasale) and those where you have to make affiliate commission payments yourself, like iDevAffilliate. The former are expensive to set up and maintain, while the latter are cheaper but require more effort. What WP InstantPay does is split the payment between you and the affiliate at the time of payment, so you never receive the money, the affiliate gets it instantly. The benefits of this are obvious, the affiliate gets paid instantly, and as you never receive the money you don’t need to pay affiliates. You can see this process if you buy through my affiliate link and if the coupon code of SUMMERTIME is still valid you can see how that works too). Refunds are even processed automatically, it is really hands off. 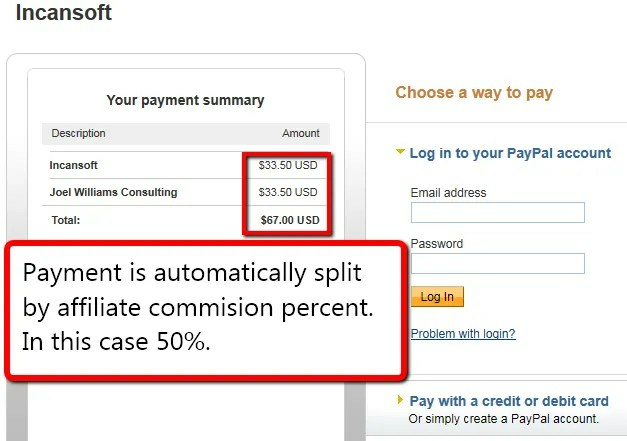 The plugin even allows you to split the payment further, with Equity Partners. So if you’ve developed a product with someone else you can have e.g 50% going to an affiliate, 25% to you and 25% to your partner who developed the product with you. What I also like is the constant improvements. Recurring payments are coming soon (great for membership sites or subscriptions), along with integration for membership plugins, coupon codes (unlimited per product), and even support for physical products. I have been impressed with their support after I messed something up in the database (hey, I like to play but even I ask for help when in trouble! ), they were friendly, responsive, and very helpful. Overall I’ve been very impressed with the plugin so far, it makes selling (at least digital) products easy, and takes the hassle out of creating all the necessary pages for thank you, affiliates, downloads, and sorts out payments before they get to you which is a great time and effort saver. Where I use this: For my new eBook – Create Your Own Best-Selling Product In Under 7 Days. Cons: Paypal a little tricky to setup in early versions; Paypal checkout page could be confusing for inexperienced buyers who see payment going to two people. WordPress software is already known for being highly search-friendly. The templates are structured in a manner that’s easy for spiders like the Googlebot to read, and it’s super easy for even non-techie users to integrate some basic keyword optimization using the tags, categories, and permalink management features. Most bloggers looking to get paid for their efforts prefer WP for these reasons.